Microwave sterilization technology, as one of the ten freshening technologies, is an effective sterilization method which can ensure the safety of products. 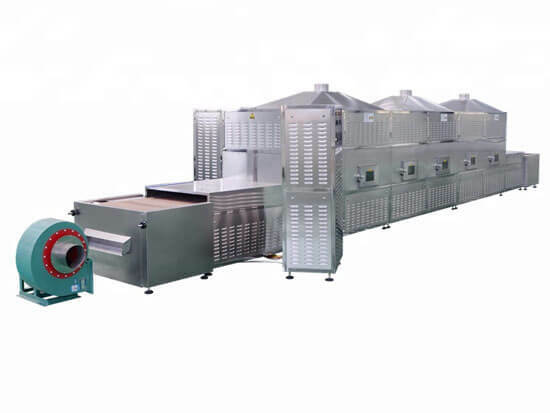 The technology of microwave sterilization is widely applied in the area of the food industry for its rapid temperature elevation, high efficiency, safety, and nutrition preservation. Our microwave food sterilization machine has enjoyed great popularity in the wide food processing industry. Microwave sterilizing machine is the most suitable machine for semi-liquid, powder and granular products. 1. The short processing time results in more fresh-like taste and texture food and improves the visual appeal of the food. 2. The reduction of processing time may also potentially increase retention of nutrients in the thermally processed foods. 3. Energy saving. The conventional sterilizing machine has defects in design which lead heat to lose in the sterilizing process. While microwave sterilization machine makes the thermal directly conducted to the food, no heat loss. 30%-50% electricity saving. 4. Easy operation. You can turn on/off the machine at any time because the microwave sterilizing machine has no thermal inertia which ensures a high working flexibility. The conveying speed is adjustable. 5. Low noise and little land occupancy. 2-3 worked are enough to operate the whole equipment. Many heat sensitive products made by conventional thermal treatments often result in considerable changes in the quality of the food and make these products unacceptable for consumption. The shorter time and more uniform volumetric heating of microwave processing offer major advantages over conventional steam retorting in producing a wide range of high-quality shelf-stable food products: liquid, semi-solid and solid. The microwave sterilizing machine is widely used for processing powder material, granular material, chemical products, grains, nut sterilizing and cooking. 1. Specialized in further drying and sterilizing dehydrated vegetables. 2. Various species and seasonings drying and sterilization. 3. Suitable for beef, pork, fish and chicken meat drying and sterilizing. 4. Drying various flowers such as honeysuckle, chrysanthemum, rose, peony, etc. 5. Ideal drying machine for nuts including hazelnut, chestnut, pistachio and so on. 6. Drying and sterilization for pills, capsules, tablets.